I'm still in catch-up mode in cooking through Flatbreads & Flavors, but I'm happy to say that I'm only 2 days late this time...as opposed to 2 weeks. A notable improvement. And actually, I was really looking forward to baking these sesame rings for one major reason (aside from the freshly baked bread factor which is always tops). That reason? Oddly enough, it was the recommended accompaniment to these tempting, oval rings. Za'atar. 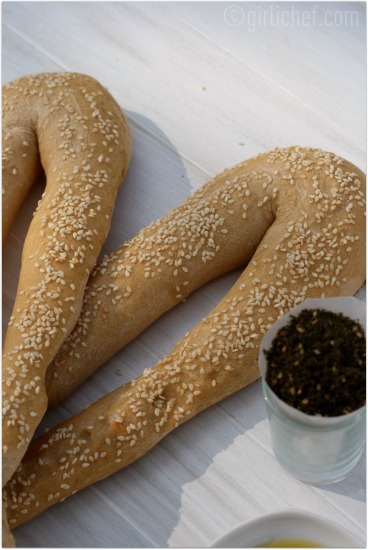 Or roasted thyme and sesame blend. You see, my favorite local market has a pretty impressive aisle housing "international" items. I find many of the imported items that I can't find anywhere else locally. From treacle and English biscuits to golden syrup and "exotic" spices. For months now, I've been eyeing a 16 ounce bag of Green Za'atar. It wasn't expensive or anything...I just wasn't sure how I would use it. I was intrigued by the look and the ingredients of roasted wheat, roasted thyme, and ground sumac (along with sesame seeds and salt). Ground sumac. What in the world is it? Sure, I'd heard of sumac. I knew the word. But what in the heck was it. Really? In the back of Flatbreads & Flavors I found my answer. Sumac is a reddish spice that looks sort of like chile powder and made from dried, ground sumac berries. It gives a pleasant acid taste to spice blends and dishes. Huh. Well, when Za'atar was listed as a suggested accompaniment, I made a beeline to the international aisle and giddily placed that bag of spice in my cart. While I've included the recipe for making Za'atar at home, if you're unable to source sumac (like me...and no I didn't look online...I wanted it NOW), this is a fantastic option. This sesame ring dough is simple and very easy to work with. My recommendations are to make sure you have a big, clear work surface for rolling the long ropes - it'll make your life so much easier. And to use a parchment or silpat lined sheet tray to lay said ropes on. The original recipe calls for them to be oiled, but I found that the dough kept sliding and shrinking back when I tried this. The lining gives the dough something to hold onto and lets the rings keep their long, brilliant shape. My rolls weren't perfectly even from top to bottom on this first try - why I'm recommending you give yourself a nice, clear, BIG work surface. I'll follow my advice next time. It didn't affect their baking or taste, though. Merely the aesthetics. I will definitely be making these again - they are wonderful while warm. Good and chewy and perfection when ripped and dipped into olive oil and touched to the Za'atar. My kind of snackin' food. Or a meal (I've mentioned that I can make a meal out of bread once or twice before, no?). Dissolve yeast in warm water in a medium to large bowl. Combine bread flour and salt in a small bowl and add to the yeast, one cup at a time, stirring in one direction with a wooden spoon to help activate gluten. In the same manner, stir in one cup of the whole wheat flour. Now, stir in the remaining cup of whole wheat flour a little at a time until the dough will no longer hold any flour (you may have some flour left over). 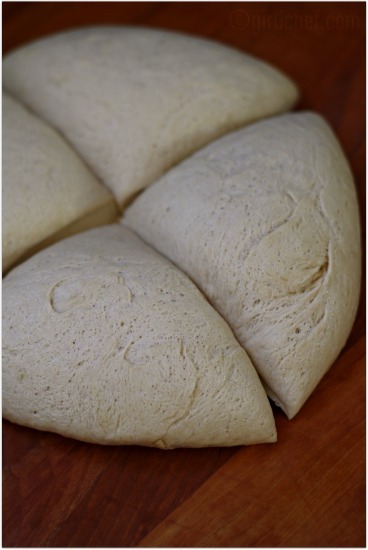 Turn dough out onto a floured work surface and knead for 7-8 minutes, or until smooth and elastic. If dough seems sticky when you're trying to knead, add in a bit more of the flour that you haven't used yet. Place in a lightly oiled bowl and cover with plastic wrap or a clean kitchen towel and allow to rise until doubled in bulk, ~1 hour. Punch down the dough and divide into 4 fairly equal pieces. On your work surface, roll each piece under your palms into a long rope, 24"-36" long. Pinch the ends of each rope together to make a loop. Place the rings on two trays that have been lined with parchment paper or a silpat. Cover and let rise 20-30 minutes. Preheat oven to 400° F during last 15 minutes or so of rise time. 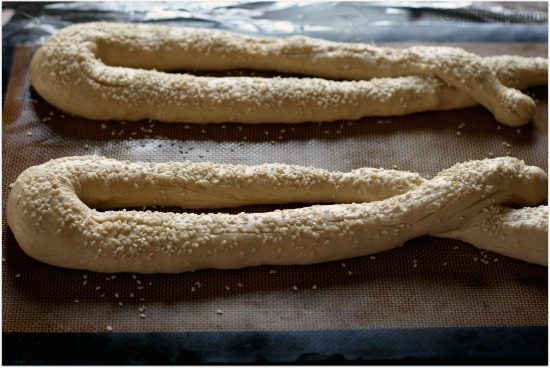 Brush each bread liberally with egg wash and sprinkle with about a quarter of the sesame seeds. Bake for 15-17 minutes or until golden. If both sheets don't fit on the same rack, switch them halfway through baking. Cool slightly on a rack before serving. Serve with olive oil and a little cone of Za'atar for dipping (dip bread in oil, then touch to the herb...or simply let the herb cling to the moist crumb of the bread if you don't want to use the oil). Place a small skillet over medium-high heat. Add sesame seeds and toaste, stirring or shaking constantly until they start to give off an aroma. Remove from heat and transfer to a bowl. Grind thyme leaves to a coarse powder in a spice grinder or mortar. Add sesame seeds and salt and grind to a powder. Add the sumac. Store in a tightly sealed spice jar or glass container. Here it's called "Jerusalem Bagel" and it's very popular! These rings are really delicious, aren't they? And isn't the olive oil followed by thyme spice mix fantastic with them? If your spice store carries just sumac (I hope it does), I highly recommend getting it. Then you can make your on za'tar. I can't wait til we can use thyme from the garden to make it. Very cool - it is bagel-esque! I'm going to try making my za'atar - have been looking at recipes with it longingly. Love sesame in baked goods. It's a beauty! OH, awesome idea! I will definitely be adding it to these. We eat a LOT of hummus around here =) thanks! I have homemade za'atar sitting in my cabinet and it's basically begging to be turned into these rings! MMmmm this looks so good and that Za'tar is extremely interesting. I have a question though, do you wait for the yeast to bloom or do you add the flour mixture as soon as you mix the yeast with warm water? I had to use sumac for a recipe but couldn't find it. Not like I knew what I was looking for anyways :) This looks great. These looks wonderful! I have not heard of Za'atar before, really new to me. The bread must be really fragrant from the nutty sesame. Beautiful bake, Heather! My kind of snacking food too Heather! I love za'taar! SO wonderful to see you featuring ka'ak and za'atar! These are two of my childhood favorites. I can still taste fresh ka'ak from outside my great uncle's house on the Mount of Olives in Jerusalem. I have never heard or seen this before Heather; love your blog; full of foodie information for around the globe. I don't think it's green sumac Lyndsey...I think it's red like one you've used before. I think the "green" in za'atar comes from the thyme. I believe. So yes, it sounds like the one you've made before. I think it would be fabulous with fish! I love za'atar (mostly because I have a crush on sumac) This just sounds like such a fun little snack or something out of the ordinary for guest. Thanks Heather! 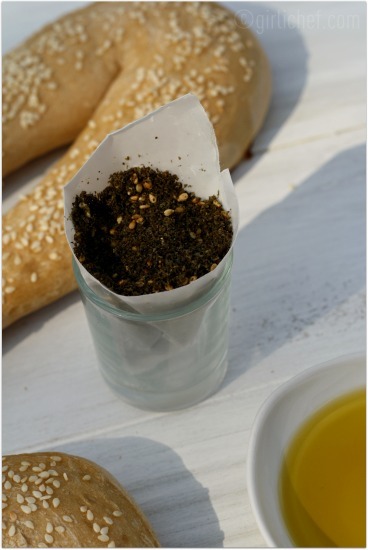 I love Zaatar.. My aunt makes a delicious Zaatar bread in which she spreads the zaatar on dough and then bakes.. becomes something like a pizza but tastes so different and divine.. Love your idea of using zaatar as a dip! I have never had Zaatar, but it sounds delicious. 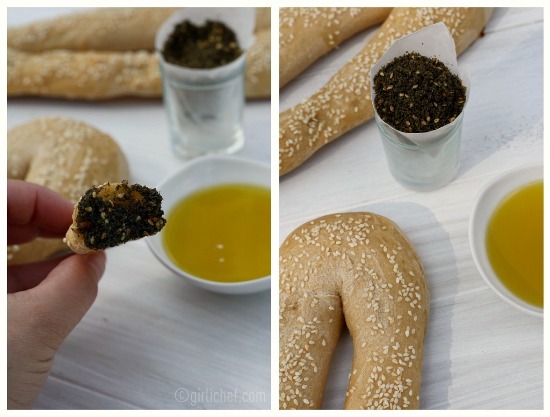 Your sesame bread rings look gorgeous too. I do love sesame seeds on breads, they add such a great flavour and texture.